If you thought scuba diving was extreme, check out these Caribbean cave diving pictures that dive into even more unknown territory. Share YOUR cave diver experience! This is the entrance to the cenote or sinkhole located on the Caribbean coast of the state Quintana Roo, Mexico. "Dos Ojos" for the language enthusiasts, is Spanish for two eyes. 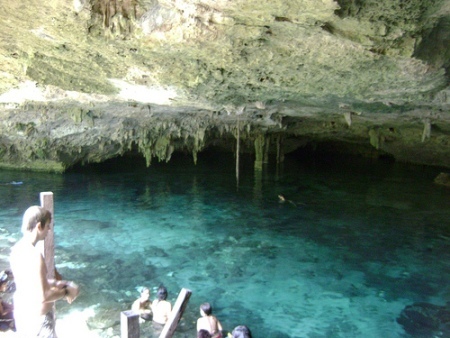 It refers to two neighbouring cenotes or sinkholes which are connected by a shared and very large cavern zone. There are opportunities for those looking for adventures of any age, with snorkeling in shallower areas and cave diving in deeper areas available. So you may be wondering, what causes these amazing sinkholes to form these caves? They are actually quite naturally formed by the removal of soil or bedrock, usually, by water. 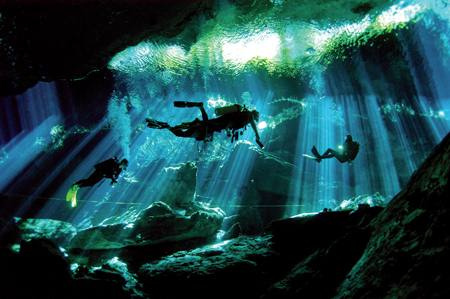 Cave Diving offers a difference to certified divers who love to explore and want to experience an adrenaline rush. How do YOU feel about Cave Diving? Share your cave diving stories! Are you thinking about cave diving? Where? First time? Do you have some fun cave diving pictures to add? Great! Click the button and find the first one on your computer. Select it and click on the button to choose it.